It’s almost dogma in longevity research that caloric restriction will extend your lifespan. Granted, I think everyone agrees that humans won’t see the same level of life extension under caloric restriction as mice, primarily because we experience a slower rate of epigenetic drift. It’s also unlikely, although still plausible, that humans will spend a large portion of their life under a 20%-30% caloric deficit. That level of caloric restriction isn’t very fun for 60 days, let alone 60 years. Which could make what I’m about to tell you all the more depressing if you’ve been practicing caloric restriction for any appreciable amount of time: The studies in mice don’t apply to you. Now, I’m not saying this because we’re human and they’re mice. I’m saying this because a recent study published in the journal Cell Metabolism has identified a big fat caveat about calorie restriction studies in mice that makes it difficult to determine if the results are due to calorie restriction or another big player in longevity research: fasting. One of the primary issues with studying any factor in biological research is control. We want to be sure that the factor we’re looking at is the only differentiating factor between the groups being studied. Unfortunately, in most calorie restriction studies in mice, this doesn’t happen because it’s difficult to do. In most studies, calorie restricted mice are compared to ad libitum fed mice, mice with constant access to food. 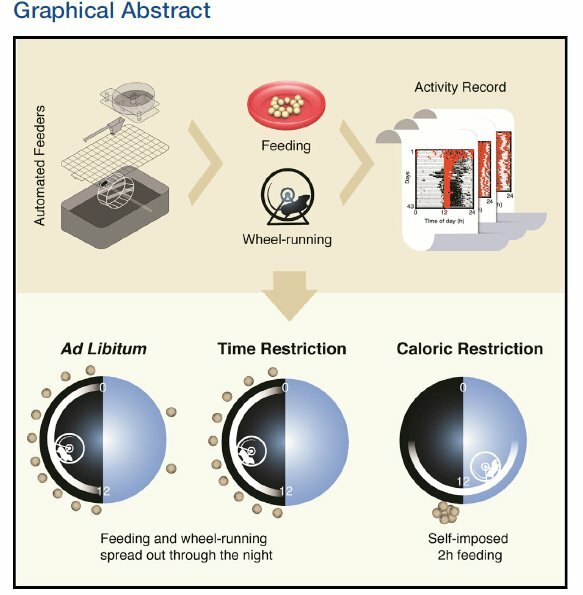 Calorie differences aside, there’s a very distinct pattern of feeding behavior that calorie restricted mice observe that ad libitum fed mice can’t: they eat all of their food in less than 3 hours. Until we see a study where they control for this, we really can’t determine if the benefits of calorie restriction in mice is due to lower calorie intake or a 3 hour eating window. This observation is what led to the development of a system to control and measure the timing and length of the feeding window, as described in the Cell Metabolism study. In this study, they found that mice under calorie restriction eat all of their food in 2 hours, which is the shortest amount of time the device allowed them to eat it in. Very interesting, but it also makes your 25% calorie restriction with a 10 hour fasting window nothing like a calorie restricted mouse with a 21 hour fasting window. In other words, these mice are practicing calorie restriction AND fasting. You may think this is a trivial issue, but it’s actually a big deal. Mice under 30% caloric restriction fed during the day in this study failed to lose weight while those fed during the night lost the expected amount of weight. This means that when they ate was important too, even though the fasting window was the same. Note: Mice are nocturnal, so night is the appropriate time for them to eat. Other studies confirm this finding and reinforce that, irrespective of meal quality or calorie content, eating at the wrong time can promote metabolic dysfunction and eating at the proper time can prevent the metabolic dysfunction caused by a high fat diet in mice. The fact that mice fed a calorie restricted diet eat their food in a couple of hours makes determining where the benefits are coming from, calorie restriction or time-restricted feeding, virtually impossible. At least until a study is designed that spaces out the meals of calorie restricted mice. Biological research has gone through a major transition over the past decade. We used to believe that the human body is a completely sterile environment where bacteria are kept out of the bloodstream. We now know this to be false. Recent evidence points to bacteria or bacterial metabolites leaking in to the bloodstream from the mouth and gut to be major factors in our susceptibility to many of the chronic diseases of aging including Alzheimer’s disease, Cardiovascular disease, Type 2 diabetes, and a host of other issues. At the root of this problem is a molecule found on certain types of bacteria called lipopolysaccharide, or LPS. As we age, whether through a change in the gut microbiome, reduced integrity of the intestinal barrier, or both, there is an increase in LPS in the blood. This is a major problem and something that likely contributes to inflamm-aging. Thus, you can see the importance of preventing this from happening. In a study looking at meal frequency in obese and healthy volunteers, a high fat diet fed over 5 meals per day led to greater levels of LPS in the bloodstream in both groups than the same food spread over only 2 meals. 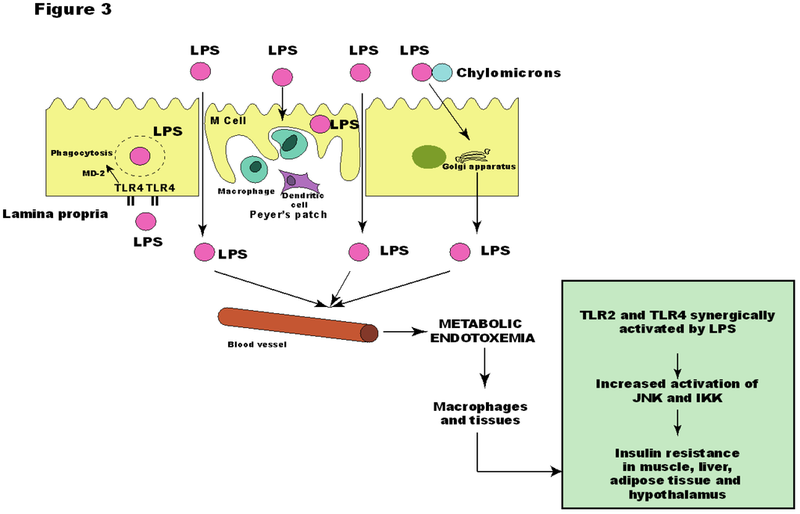 Furthermore, in the obese group, LPS was still elevated at the end of the night when they ate 5 meals. Bloodwork in the obese group eating 5 meals also showed elevated insulin, blood glucose, and triglycerides; these factors are indicative of metabolic dysfunction. Now, I don’t necessarily want to dissuade you from practicing calorie restriction. I think the combo of calorie restriction without malnutrition and time-restricted feeding is probably optimal. But having tried both, TRF is far easier and allows one to enjoy many foods and beverages that are simply not feasible under calorie restriction. If most of the benefits to longevity in these mouse studies is due to lower meal frequency and a shorter eating window, blind calorie restriction without attending to these other factors may not lead to the outcome you’re looking for. In my opinion, it would be pretty depressing to learn that I’ve been avoiding many things I enjoy unnecessarily and not receiving the benefit I’m looking for. This is a big problem, but one we may find a solution to soon. I have no intention of waiting to find out. Since I’ve been practicing my own brand of time-restricted feeding for several months, I intend to find out if TRF is sufficient to prolong my health- and lifespan. That’s why I’m kind of excited about the DNA methylation test by Epimorphy I just took, which I covered in a blog you can find here. Rather than wait another couple of decades for the results in people currently practicing calorie restriction, I’ll look at what my current lifestyle is yielding in terms of my rate of aging. Trust me, I don’t feel the slightest bit of dissatisfaction with my current lifestyle and there are a few things I know will probably improve my results without having to resort to calorie restriction. Stay tuned! Do you believe 14 hours is the minimum for IF? I like to differentiate between time-restricted feeding and IF because they’re not really the same thing. TRF is more about being in line with your circadian rhythms while IF is about not eating for a prolonged period irrespective of circadian factors. Depending on your health, a 12 hour daily fasting window may work great for you while some people may need 14 hours until they re-establish proper blood glucose control, blood pressure, etc. My current regimen involves limiting my feeding window to 10-12 hours every day with focus on diet quality only on M-F. Works great for me, but I’m also tight on controlling other circadian factors such as light exposure, physical activity, sleep, etc. If you’re not doing those other things you really can’t expect optimal results whether you do TRF or not, although a longer fasting window may make up for some of it. Oops, if your question is simply about what constitutes IF, I’d say the standard answer to that is 16 hours or more is necessary. Thank you, I did mean TRF! In the calorie restricted feeding study is it showing they ate at the 2h window right before day started, or immediately when night started? I see that, I’m sorry – I meant did they eat mouse “breakfast” (beginning of activity) or mouse “dinner” (end of activity period). If it’s a normal clock it’s breakfast, but it looks like the mouse is running counter-clockwise so I wasn’t sure lol. Lol, gotcha, it was at the very beginning of the dark phase, which is their active phase. Basically, if you provide them with a set amount of food that is less than their caloric needs and you give it to them right after they wake up they eat it all in 2 hours.